10 minute flat walk to town, no steep hills! 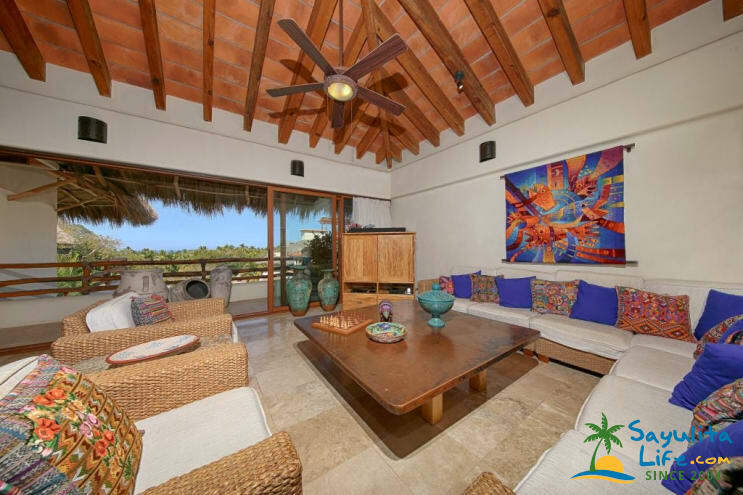 Villa Cielito Lindo at Los Almendros in Sayulita is a beautiful 3 bedroom Penthouse condo with private elevator in a quiet area on the sought after north side of Sayulita. Located just 1.5 blocks from the beach, and a quick, flat 10 minute walk to the center of town, there is no need for a rental car or golf cart here. If you prefer to drive, there is secure on site parking with 24 hour security. The living and dining space is expansive, with soaring roofs, plenty of seating and lovely terraces to enjoy the ocean views and sea breeze. There is indoor dinner seating for 6 as well as covered outdoor seating for 6. There is another built in sofa on this terrace for additional seating. The spacious kitchen has slab granite counters, stainless steel appliances and all the appointments to prepare delicious meals should you choose to dine at home. There is of course, a coffee maker, blender, and microwave as well as all the dish and glassware and neccesary pots and pans. There is barstool seating at the large granite island, as well as indoor and outdoor dining options. The private, ocean view rooftop terrace is where you will want to spend all of your time. the covered area has a soaring palapa roof with ceiling fans for your comfort, plenty of seating, and dining space. There is an outdoor BBQ and even a Jacuzzi! There is plenty of room in the covered, shaded area, or you can also lounge in the sun if you prefer, with the azure Pacific Ocean in full view. The bedrooms have en suite baths, air conditioning, and comfortable beds. The master bedroom has a king size bed, ensuite bath with dual sinks and walk in shower. The second bedroom has a king size bed, ensuite bath with dual sinks and walk in shower. The third bedroom / office has two twin beds and desk workspace for two should you wish to stay connected while on vacation. Please use the contact form to get in touch, by email or telephone with any questions and to arrange your stay. We look forward to welcoming you to Villa Cielito Lindo in Sayulita!